Otis came to us a very scared bird. 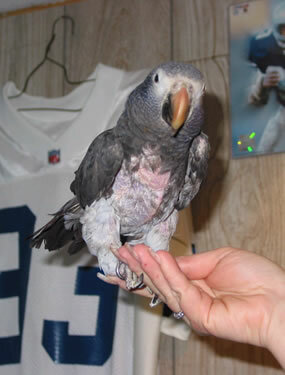 He is an African Grey Parrot who loved to growl and scream. He has lived with us for quite a few years now. This whole saga started when I was called and asked if I could find a home for Otis. We made 19 calls to try to place him, but the problem was that he was described as "feisty, a loud growler, and you needed a glove to handle him". After several people were brave enough to go see the "nasty" bird, he was still in need of a home. I decided that I could not live with myself if I left Otis behind. The conditions the bird was in were not the best (compared to what our birds are used to, I'm sure). The cage that he was in was broken. He had no toys or perches. His cage was placed on linoleum floor in February, in a room with no heat. He was surrounded with kids, cats and dogs. . How could I leave him behind??? ?As he was screaming, he was placed in the carrier and off we went. The first thing that was needed was a new cage to keep him in. Once a suitable cage was found, it was off to his foster home until he could be vet checked. My home is small and there was nowhere that this bird could be quarantined without possible risks to the rest of my flock. Once out of quarantine and after an O.K. from the vet, I felt that it was safe to move Otis to his new home. He was set in my bedroom (the furthest away it could be placed from the others) and quarantined for another 30 days. During this time the bird did nothing but scream and growl at anything that moved. Now the real test was ahead of me. How could I get this bird to trust me????? The noises that came out of Otis were unbelievable. His growl was louder than any dog that I've ever heard. Any time that anyone approached him, the noise was deafening. I didn't think that he could stay in my house for long. Just as I was thinking about placing him in a breeding situation, the noise started to subside. The growl was not as loud, though still there every time that he was approached. Through a lot of determination, time and effort I found out that Otis was all growl and no bite. It is still a day-to-day effort to work with him, but well worth the effort. Otis has become very affectionate with me. He will tolerate just about anything I do to him. Even to the point of cradling him like a baby. Anyone that comes to my house knows that Otis will still growl at the drop of a hat, but we will continue to work on this. It's all part of living with Otis.